Australia were 132/7 after 19 overs at the rain stoppage. The Melbourne T20I between Australia and India has been affected by the rain similar to the first game of this three-match T20I series in Brisbane. Australia finished with 158/4 in their 17 overs while India made 169/7 and still lost the game as they were chasing a revised DLS target of 174. 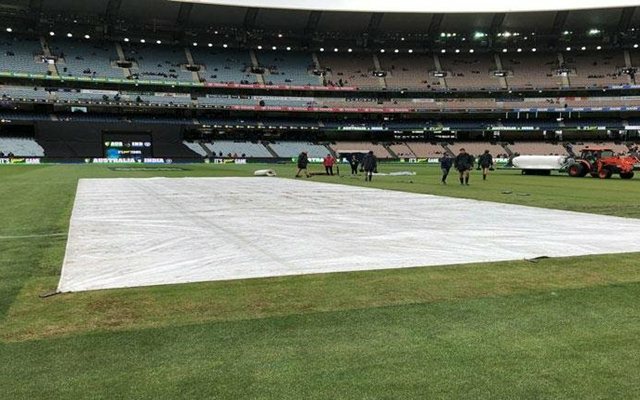 The crucial 2nd T20I in Melbourne was expected to be interrupted by rain as the ground was under covers until one hour before the scheduled start of the game. India took the field with an unchanged playing XI despite Khaleel Ahmed and Krunal Pandya conceded too many runs in the first game. The duo made a strong comeback by dismissing Chris Lynn and Glenn Maxwell the two batters who punished them the most in the previous encounter. India held the key in the game from the very first over where Bhuvneshwar Kumar sent back Aaron Finch for a first-ball duck. The hosts were reduced to 74/6 by the 14th over. However, a quick-fire 9-ball 20 from Nathan Coulter-Nile and an unbeaten 30-ball 32 from Ben McDermott helped Australia move to 132/7 by the 19th over. The heavens opened up in the 19th over but the umpires let Jasprit Bumrah complete his over before it was just too heavy for the game to continue. 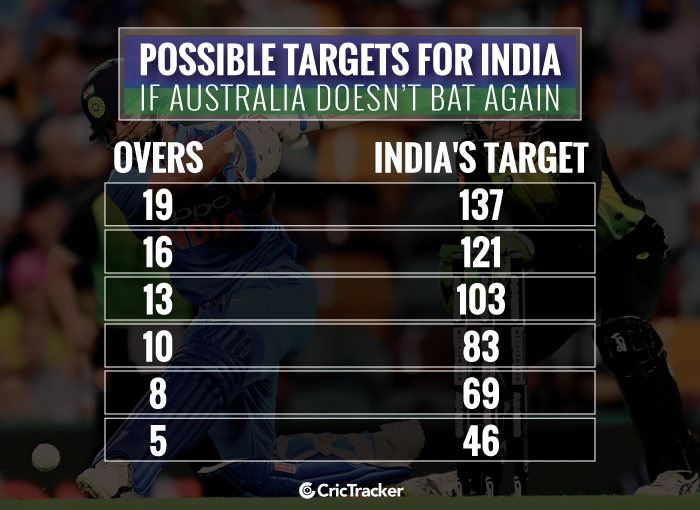 In case if Australia doesn’t resume their innings, India will be chasing 137 in 19 overs; four runs more than Australia’s total. The visiting side will need 46 runs in five overs to win the game if only five overs of play are possible; the minimum overs to produce a result in T20s. India might not be happy if more overs are reduced. They would be chasing 83 in ten overs and will start their chase with a required rate of 8.3 where the Aussies scored at less than seven runs an over.